If you could have just one plant in your garden to attract monarch butterflies, Liatris ligulistylis would not disappoint! This type of Liatris is also referred to as Rocky or Meadow Blazing Star. According to Dr. Tom Barnes from the University of Kentucky, this particular species of liatris emits a specific odor to attract monarchs. From what I've seen, it drives them crazy! A couple autumns ago, I attempted to grow this showy liatris species from seed. I was excited at the prospect of seeing this brilliant butterfly magnet in action the following summer. Unfortunately, I was not aware of two important issues. I had read this from a couple sources and found it to be true from my experience. 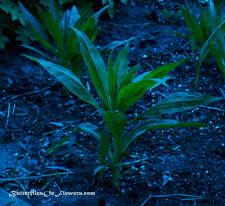 None of these liatris plants came up in our garden the following summer. I'd also given some to a friend who had the same results. This plant doesn't bloom in it's first year as it's busy developing a solid root system . Unfortunately, my uncooperative seeds and poor planning meant replanting in summer 2009 and waiting until 2010 for the beautiful, bushy blooms to appear and work their magic. This time I got plants from a reputable nursery. When I received them I was a little worried some of them wouldn't survive shipping. Over the summer, they grew but I was underwhelmed by the results. The cold summer of 2009 ended and I was afraid I may have to start all over again next year...would I ever have success with these plants? 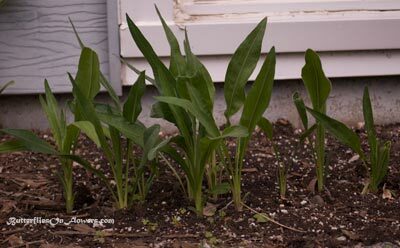 Below, is a row of Liatris ligulistylis I had put on the side of our house by where we grow milkweed for monarch caterpillars. I almost threw these plants away because I had no hope they would survive. They are thriving now and should flower in August! Note: This area of our yard receives sun from late morning to sundown and is sheltered from the wind. These plants seem to like it! Again, don't expect instant results the first year, but if you get plants now, an amazing spectacle awaits the following summer and beyond. I will post more pictures and videos of this butterfly plant as it blossoms and attracts butterflies.